Director Paul King and screenwriter Hamish McColl’s big screen version of one of Britain’s most beloved characters from children’s literature is a charmer from beginning to end. If you were a child of the 70’s and early 80’s and spent any time watching PBS, Nickelodeon, or USA Network’s Calliope, then chances are you know and have very fond recollections of Paddington Brown, the cuddly talking bear with the red hat and blue duffle coat from Deepest, Darkest Peru whose home is in London with the kindly Brown family. If you happen to fall into that age range, chances are also good that you maybe have children or even grandchildren of your own who have not had the opportunity to be charmed by the misadventures of the kind and ever-polite bear with a slight marmalade addiction and a knack for getting into trouble. If either or both conditions are true, then there’s no better chance to get to know children’s literature author Michael Bond’s beloved creation than the new live-action production from director Paul King and Harry Potter film series producer David Heyman. It’s a bright and winsome film that honors the spirit of the source material, while telling an original story that effectively re-introduces the Browns and their very rare bear houseguest to longtime fans and new fans, too. Their simple lives, undisturbed by any further intrusions by mankind, are forever changed by a natural disaster that leaves them homeless. Remembering the old explorer’s heartfelt promise that they would always be welcome in London, Lucy sends her nephew off as a stowaway on a cargo ship bound from Britain. One long voyage hidden in a lifeboat later, and the young bear, with nothing except a battered suitcase, the old explorer’s hat on his head, and a tag around his neck asking someone to give him a home, finds himself dodging commuters in the midst of one of London’s busiest train stations, none of whom return his cheerful greetings or seem interested in taking him in. It’s then that the Browns — stuffy and overly cautious Henry (Hugh Bonneville, “Downton Abbey”), kindhearted and eccentric Mary (Sally Hawkins), and their children Judy and Jonathan (Madeleine Harris and Samuel Joslin, respectively) — come across the bear at the station while on their way home, and over Henry’s protestations Mary insists they bring him home for a night and try to help him find a proper home. Needing something to call him aside from his bear name, they find inspiration from their surroundings, and come to name him Paddington. From there, the real fun begins, as Paddington begins his quest to find a permanent home, and along the way learns what it means to live in modern London with all its everyday conveniences and challenges. Unbeknownst to the bear, the Director of Taxidermy at the National History Museum (Nicole Kidman), who learns of Paddington’s arrival soon after the Browns take him home that first night, wants nothing more than to give him a permanent home … in her unparalleled collection of stuffed museum specimens. Part of what makes Paddington work as well as it does is that cast and crew work to achieve a balance between physical humor and wit in order to win audiences of all ages over. Yes, there are a few over-the-top set pieces and gags reliant on pratfalls and gross humor meant to make the kids laugh out loud, and they work. Yes, there’s a scene involving a member of the cast disguised in drag in order to get past some rather oblivious guards, something that just about always makes kids laugh if it’s done right, and it is done right here. No doubt it’s the presence of that last scene, and the gently bawdy exchanges it inspires, that earned the film its PG rating, but parents, please don’t fret about bringing the kids to see it just because its not a G-rated film. This is barely (no pun intended, really) a PG film. But for all those outlandish moments, there are heartfelt, earnest ones that don’t feel obligatory or saccharine, moments made memorable by actor Ben Whishaw’s pitch perfect voice bringing to life Paddington’s youthful wonder at his new world, his unfailing kindness, and his eminently British manners, even in the face of less-than-genteel behavior from those he meets. Interestingly, Colin Firth was the studio’s original choice to give voice to Paddington in the film, but a change was made when it became clear that his voice just didn’t fit. As handsome and distinguished as Firth’s voice is and might have been in the role, Whishaw more than makes the decision to make the switch pay off. He makes it his own, and by the end of the film it’s difficult to imagine anyone, Firth or otherwise, doing a finer job. The rest of the film’s casting helps a great deal, as well, for their talent and also their marketing value in terms of how familiar they should already be to U.S. audiences. With four cast members already well known for playing prominent roles in the Harry Potter series (Walters, Broadbent, Gambon, and Staunton), one already beloved here across the pond for his work on “Downton Abbey” (Bonneville), Kidman, and no less than the Twelfth Doctor on the current “Doctor Who” series (Capaldi), the film is a virtual Who’s Who of British film and TV talent, and that’s not even counting cameos. All of them, in particular Kidman in the villain role, look like they’re having a ball in the film, and that enthusiasm for the material is infectious. Watching their work here, it’s safe to assume that given the chance, any one of them would have loved to give Paddington a home had they found him at the train station. Give this film a chance, and it’s a good bet you wish you could take him home, too. 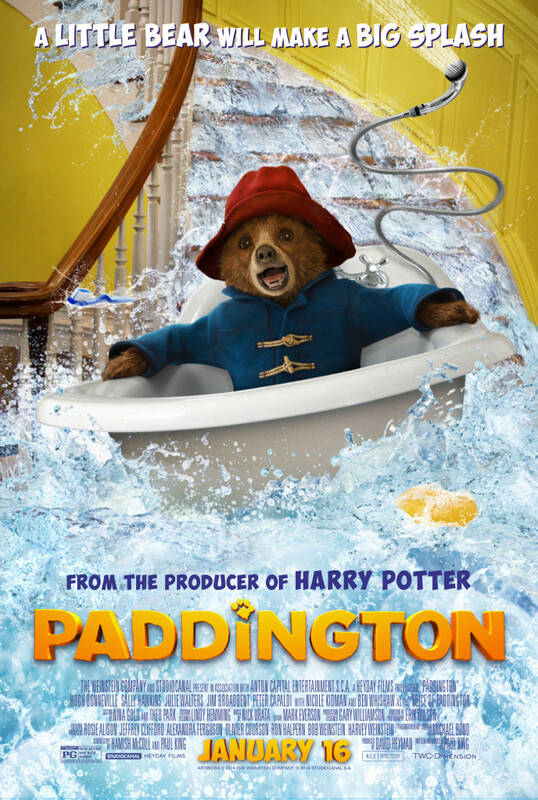 Starring Hugh Bonneville, Sally Hawkins, Julie Walters, Jim Broadbent, Peter Capaldi, with Nicole Kidman and Ben Whishaw as the voice of Paddington. Directed by Paul King.